Organic Tea tree oil is strong and proven antiseptic. Enriched with tea tree oil along with Jojoba, Olive and Wheat germ oils. Acts as a natural remedy for acne prone skins and prevents blemishes. Ancient Living Tea tree Luxury Handmade soap is enriched with tea tree oil along with Jojoba, Shea butter, Olive and Wheat germ oils. This masculine bar acts as a natural remedy for acne prone skins and prevents blemishes. 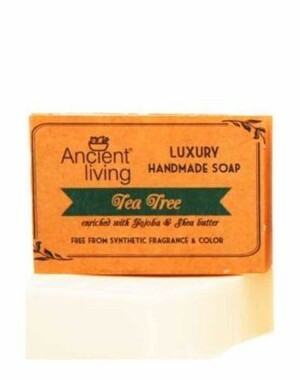 Organic Tea tree oil is strong and proven antiseptic. Its powerful action eliminates germs causing acne and other fungal infections. Shea butter has a high concentration of vitamins and fatty acids which incredibly nourish and moisturise the skin. Help in collagen production and skin strengthening. It also has anti-inflammatory properties. Jojoba oil acts as a natural skin conditioner. It helps in modulating sebum production. Olive oil has a soothing effect on the skin. Wheat germ oil has age-defying properties that help soften and moisturize skin. It has over 23 different nutrients that are vital in keeping skin healthy. It helps avoid skin problems like eczema and dry skin. It can be used as an antiseptic soap for sportsmen and athletes who are engaged in strenuous physical activities.